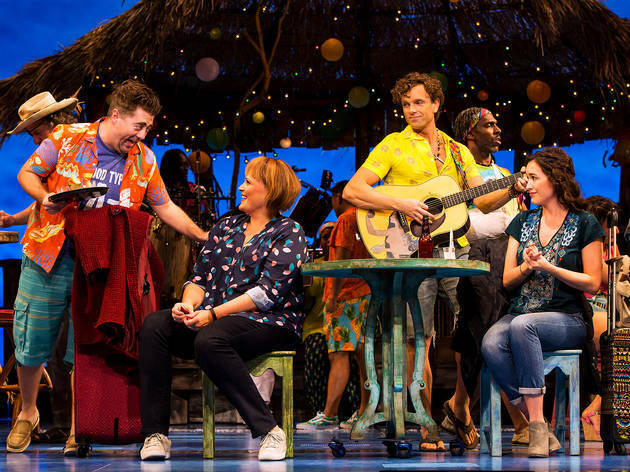 Tropical troubadour Jimmy Buffett’s catalog gets a gaudy, shoddy jukebox treatment. 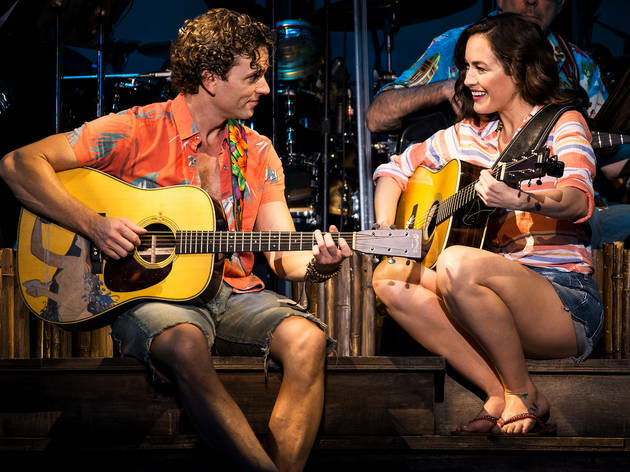 Jimmy Buffett is the latest pop musician to get his own Broadway musical, but this is far from the first expansion of the Buffett brand. 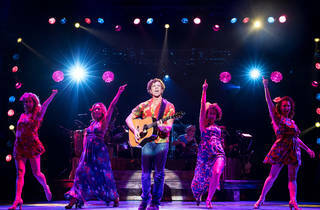 For decades now, the island-loving singer-songwriter has been putting his name on restaurant chains, casinos, resorts, beer bottles, boat shoes and retirement villages, all of them hawking the same strenuously laid-back strain of fetishized leisure as much of Buffett’s music. 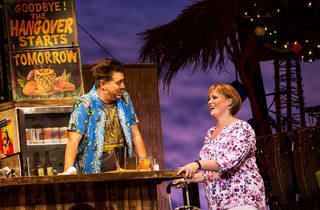 “Work is a dirty word around here,” says one character early in Escape to Margaritaville, establishing the Buffett vibe. That same anti-work mentality pervades the whole show—so much so that hardly anything works in it. 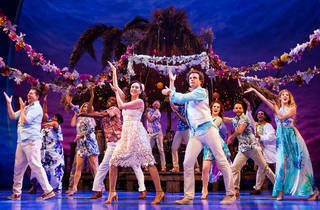 The musical’s plot centers, naturally, on a tropical island resort, where Tully (Paul Alexander Nolan) is the resident beach bum and bandleader. 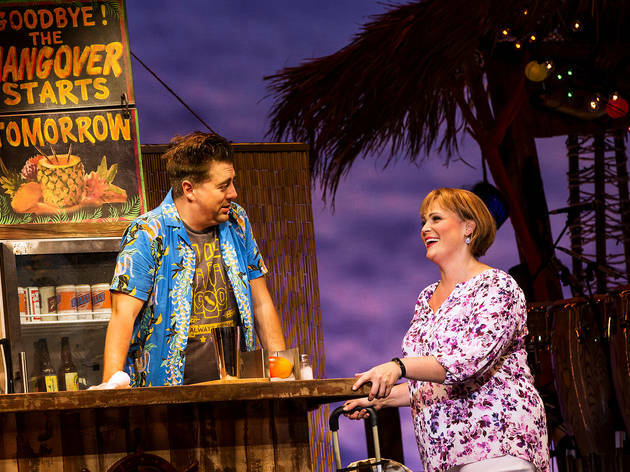 He’s accustomed to weeklong, commitment-free flings with female guests, but he sees something different in Rachel (Alison Luff), a workaholic do-gooder environmental scientist who just (obviously) needs to learn to relaaaaaax. Rachel arrives with her best friend Tammy (Lisa Howard), who’s getting in her bachelorette week before marrying the schlubby, ungrateful fiancé who’s got her on a starvation diet while on her vacation, so she’ll look thinner in the wedding photos. (If you’ve already guessed which Buffett tune becomes her jokey big number, have a cheeseburger.) But Tammy gets a strong urge to cheat—on the fiancé, if not also the diet—when she meets Tully’s good-natured burnout pal Brick (Eric Petersen), who thinks she’s gorgeous just as she is. And that’s about it as setup goes; just add ice, shake, pour and wait for the destined couples to get together by the end. 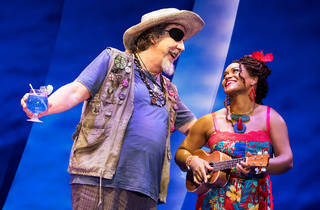 The characters—including the other island residents we meet, a grizzled adventurer-in-his-own-mind (Don Sparks) and the gossipy resort manager (Rema Webb)—are standard-issue sketches without much in the way of real-world stakes. Elsewhere, the writers seem to be rushing headlong past potentially interesting plot developments. 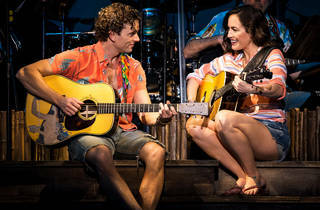 When Rachel initially shuts down Tully’s declaration of love, saying they both have more to do before escaping to the island life for good, O’Malley and Garcia make that process laughably painless: In a 10-minute fast-forward sequence that’s the equivalent of a movie’s training montage, Tully gets discovered, records an album and becomes a Grammy-winning music star, while Rachel finds the right funding for her renewable energy idea so she can, one presumes, quit science. Boom, it’s three years later, the pair’s attitudes and latitudes are ready to line up, let’s all go to the beach. If only the integration of Buffett’s music were so smooth. Whether it’s his numerous novelty tunes or his more heartfelt story songs, few of the 27 numbers represented in here (some in just snippets or medleys) are natural fits for character development, and you can feel the strain of the writers trying to find places for them, whether it’s a stilted conversation between Tammy and Brick about their parents’ expectations (to set up “We Are the People Our Parents Warned Us About”) or Tully’s casual mention that his father and grandfather were both fishermen (cue up “Son of a Son of a Sailor”). 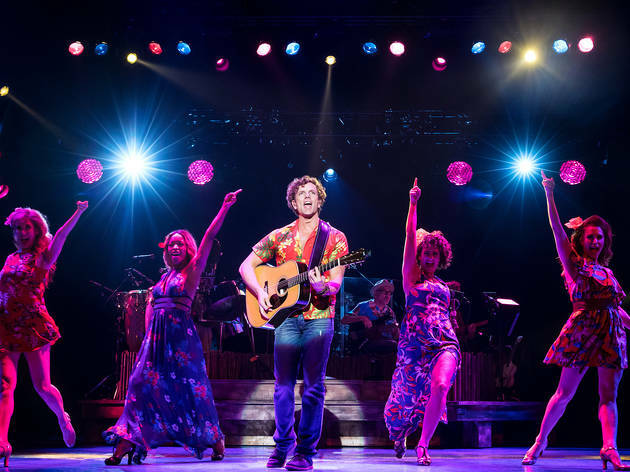 At other points songs that Buffett wrote for characters decades ago simply don’t work in context of the show. “He Went to Paris,” which Buffett wrote in 1973 reportedly about a man he met who’d suffered losses in World War II, includes the line “Well, the war took his baby / Bombs killed his lady / And left him with only one eye.” When Tully sings it here about Sparks’s character, who math tells us would have been born during WWII, it explains his eyepatch but leaves us with many more questions. The songs are listed in the program in alphabetical order, so if you’re familiar enough with the Buffett catalog you could make a game for yourself of guessing which tune the characters’ awkward non sequiturs are priming us for. Someone randomly mentions shrimp and sponge cake in the same sentence? We’re probably about to be wasted away again. Garcia, notably, has created some very smart TV comedies in recent years, including My Name Is Earl and Raising Hope. But the plotting, characterizations, jokes and—unfortunately—gender dynamics here are more in line with Yes, Dear, the insipid sitcom he and O’Malley worked on together in the early aughts. 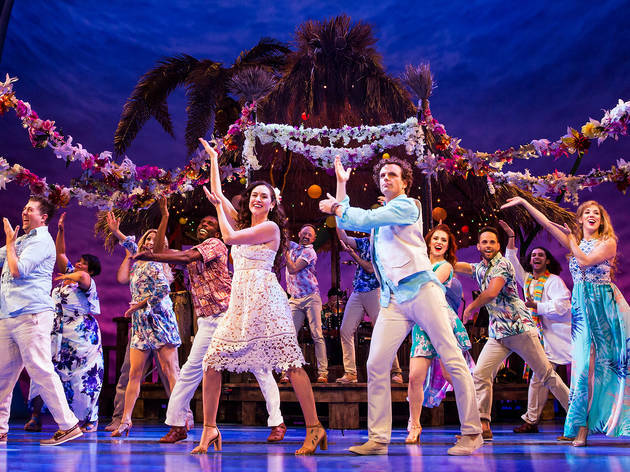 Given Buffett’s huge and loyal fan following, Escape to Margaritaville—which is headed from here to a Broadway opening in the spring—could be a decent hit in spite of its muddled, gaudy, and bizarrely paced storytelling. 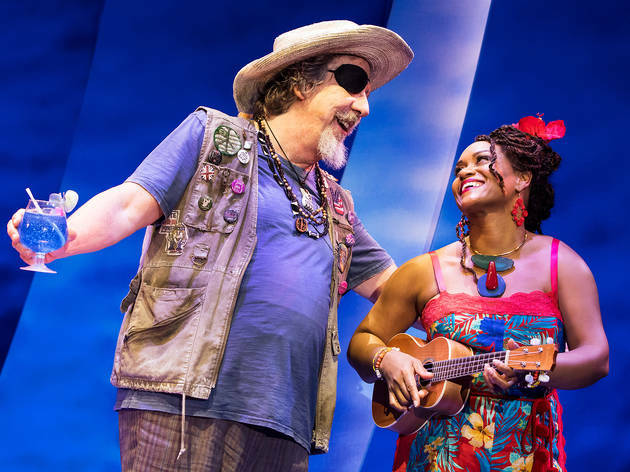 The cast is genial and game (Luff, particularly, adds much-needed layers to what could be an easy caricature), and the whole Parrothead thing, after all, is about not being too uptight. Plenty of those around me in the audience Wednesday night were delightedly humming along. For those of us looking for a story worth caring about, though, the vibe here is just too chill. In the Buffett platonic ideal, these characters don’t really have any problems—and dramatically, that’s a problem. Oriental Theatre. Book by Greg Garcia and Mike O’Malley. 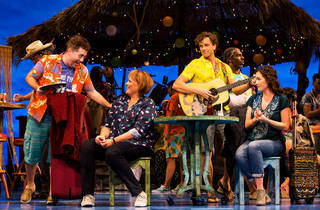 Music and lyrics by Jimmy Buffett. With Paul Alexander Nolan, Alison Luff, Lisa Howard, Eric Petersen, Rema Webb, Don Sparks. Running time: 2hrs 25mins; one intermission.